Greyhounds race at Flagler Dog Track in Miami, Florida. Florida is home to 12 of 18 tracks in the United States. Steroids are banned in Great Britain and Australia, where the sport remains popular. The Florida Senate has passed a bill that would ban injecting racing greyhounds with anabolic steroids. The bill (SB 674) was approved by a 31-6 vote on Friday. Its next stop will be to the Florida House, where a similar bill has not been heard in committee. The House passed the same bill last year, but it died in the Senate. Florida is home to 12 of 18 tracks in the United States. Steroids are banned in Great Britain and Australia, where the sport remains popular. Supporters of the bill say the use of steroids keeps female greyhounds from going into heat and losing racing days. 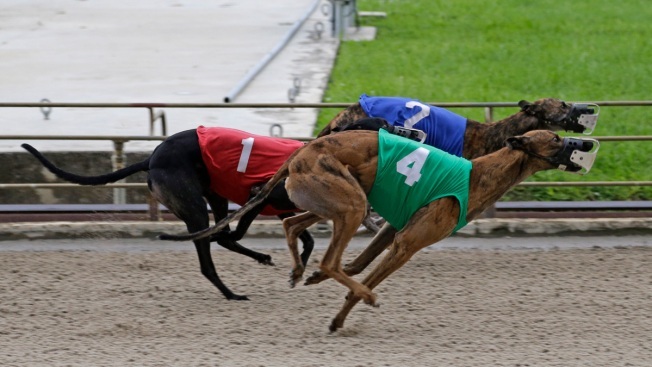 Representatives from Florida's Greyhound industry argue steroids don't enhance performance.